At the rickety bridge between the ancient arts of mortal combat and our future dystopia lies the technoillogical miracle of PING TRON. A unworldly marriage of ultraviolent ultraviolet, the monastically-inspired regime of table tennis, our facilities and your festival promise a unique and exceptional interactive installation for all ages, any time of day or night. PING TRON is a completely new phenomenon. 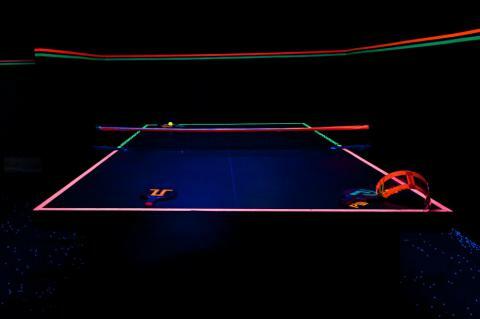 The speedy, exciting game of ping pong played in the alien glow of UV-light is an unforgettable experience. It may yet be recognised as the greatest of the modern world's inventions. But it is already a tried and tested festival success story. Find out about 'PingTron Responds' campaign to build schools for refugees.